The straight square seat and elegantly designed back reflects the classical styling of this precast concrete park bench. These park benches are constructed from 'built to last' steel rebar reinforced concrete construction ensuring its durability. 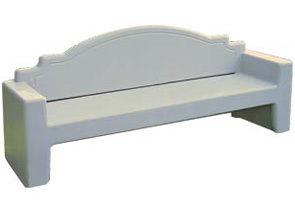 These precast concrete benches are ideal for your school, park or city. Available in three concrete finish options; Weatherstone, Smooth Stained Acid Wash, and Ground Glass Concrete (qualifies for LEED® points). Ground Glass Concrete Finish options; choose the preferred finish, select your desired matrix and then pick the recycled glass color to best suit your needs.